First release and first vintage to hit California. The wines of Sebastian Congretel come to us from an importer that already has a couple Beaujolais producers in their lineup, including the very famous Lafarge Vial project from famed Burgundy producer Frédéric Lafarge. To add another, brand new producer, means they were impressed with his wines upon first taste during a visit to the region. Sebastian studied under Julien Sunier, another young and talented producer raising eyebrows over the last five years of Beaujolais enlightenment. 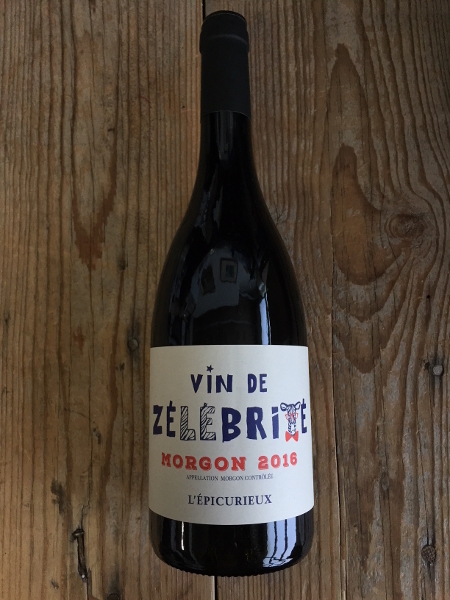 A savvy move in naming the domaine l’Épicurieux, it derives from the Greek philosopher, Epicurus, who sought happiness through restraint and balance. This is 100% from 'Les Charmes', a worthy vineyard with a south facing hillside above the village of Morgon. I do wonder how he seized a parcel from such a prominent spot, so early in his career. Pair with quiche, ahi tuna steak burgers, grilled atlantic char, white bean and ham stew. Label I.Q. : ‘Vin de Zélébrité’ is a nickname relic from his days living if the 11th arrondissement of Paris, partying at a level his friends thought had one part zeal and one part celebrity.